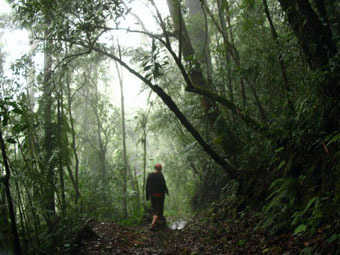 My research integrates ecology, parasitology, and ecotoxicology. My interest in both applied and fundamental ecology is reflected in my research, which highlights both anthropogenic and non-anthropogenic factors that affect community structure and species interactions, with an emphasis on aquatic communities and host-pathogen interactions. I study amphibians because they are considered the most threatened vertebrate taxon on the planet with over one third of amphibian species listed as threatened. My dissertation focuses on investigating potential causes of amphibian declines, including pesticides, the pathogenic fungus, Batrachochytrium dendrobatidis (Bd), and the synergy between these factors. My research incorporates diverse topics, but always in an applied and realistic way. McMahon, T.A., R.W. Bavis, J.R. Rohr. 2005. Presented: Acidic water causes abnormalities and mortality in the neotropical frog Epipedobates tricolor (Anura: Dendrobatidae). In: Mt. David Summit Poster Presentation at Bates College. McMahon, T.A., N.l Halstead, S. Johnson, T.R. Raffel, J.M. Romansic, P.W. Crumrine, R.K. Boughton, L.B. Martin, J. R. Rohr. 2008. Presented: “Chlorothalonil: a possible endocrine disruptor” in “Global Challenges for the 21st Century” Poster Session at the University of South Florida. McMahon, T.A., N. Halstead, S. Johnson, T.R. Raffel, J.M. Romansic, P.W. Crumrine, R.K. Boughton, L.B. Martin, J. R. Rohr. 2009. Presented poster: “Chlorothalonil: an immunomodulatory and deadly fungicide to amphibians” at South Eastern Ecology Conference. McMahon, T.A., N. Halstead, S. Johnson, T.R. Raffel, J.M. Romansic, P.W. Crumrine, R.K. Boughton, L.B. Martin, J. R. Rohr. 2009. Presented: “Chlorothalonil: an immunomodulatory and deadly fungicide to amphibians” at Herpetology conference.. Featured in article on University News (2011): “USF Study Finds Common Fungicide Lethal for Frogs.” Written by Vickie Chachere. (http://news.usf.edu/article/templates/?a=3313). Featured in article in Tampa Bay Times (2011): “USF study concludes that common fungicide is deadly to frogs.” Written by Craig Pittman. Printed in Tampa Bay Times. (http://www.tampabay.com/news/environment/wildlife/usf-study-concludes-that-common- fungicide-is-deadly-to-frogs/1162355). Feature article on www.baysoundings.com (2010): “Fungicide Toxic to Tadpoles, USF Researcher Shows.” Written by Vicki Parsons. 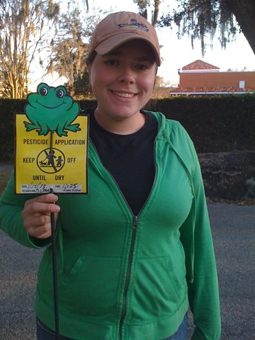 (http://www.baysoundings.com/fall10/Stories/Fungicide-Toxic-to-Tadpoles-USF-Researcher-Shows.asp). Featured in article on www.orlandosentinel.com (2010): “USF doctoral student wins grant from Saves the Frogs!” Written by MA Gentleman. (http://blogs.orlandosentinel.com/features_lifestyle_animal/2010/06/usf-doctoral-student-wins- grant-from-save-the-frogs.html). Feature article in ScienceNews (2010): “In field or backyard, frogs face threats: Amphibians and other sensitive groups encounter chemicals across the landscape.” Written by Susan Milius. ScienceNews, September 11, 2010; Vol 178 #6, p 28. Featured in article on www.gogreennation.org (2010): “Save the Frogs! Travel Grant awarded to USF student for her discovery.” Written by Henry Taksier. (http://www.gogreennation.org/2010/06/save-the-frogs-travel-grant-awarded-to-usf-student-for- her-discovery/). Featured in article in The Bates Star (2007): “Frog in Her Heart.” Written by Elissa Bass and Jay Burns. (http://www.bates.edu/magazine/back-issues/y2007/spring07/features/frog-in-her-heart/). Featured in article in Bates College Magazine and website (2007): “Taegan McMahon ’07 gives frogs the acid test” (http://cms.bates.edu/x159434.xml).